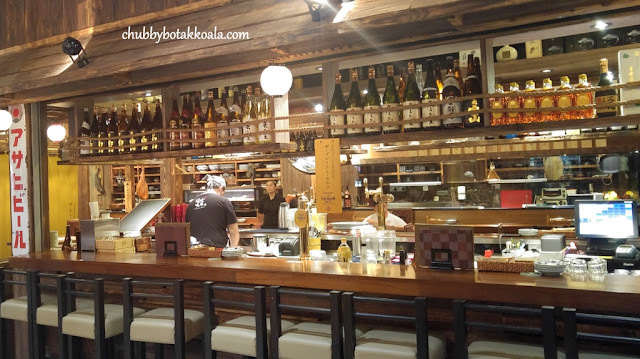 Izakaya is known as a Japanese drinking establishment that served casual and relative bar snack. 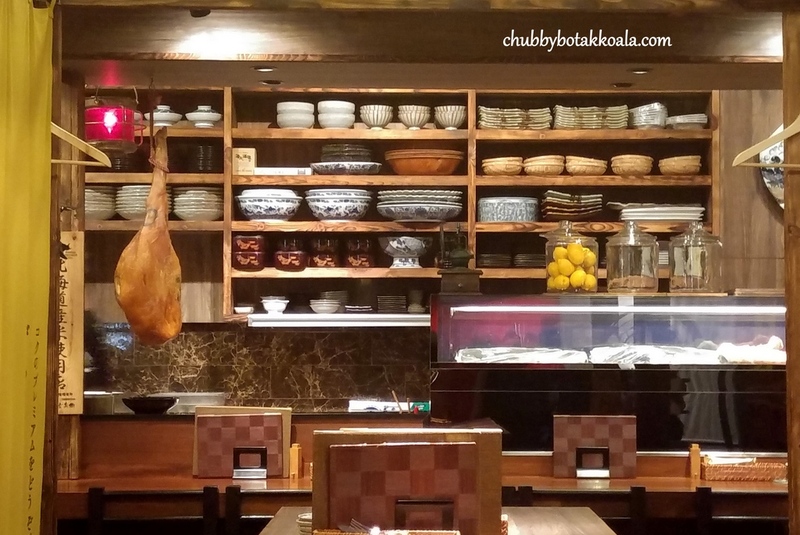 While it is still popular as a watering hole, it seems that Izakaya in Singapore has churn up a higher grade / quality dishes to accompany the drinks. 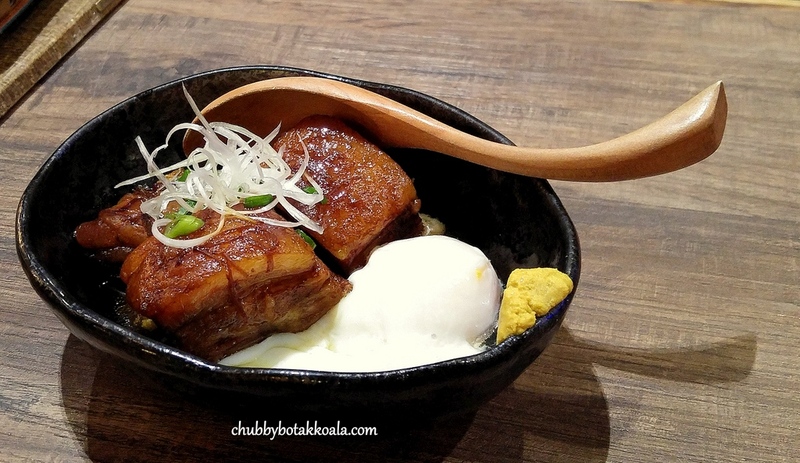 One of those Izakaya in Singapore that attracted our taste buds is The Public Izakaya 2. After a few visits, we are confident to recommended some of the dishes here. For Starters: Reba Shoyuzuke ($8) is Chilled Chicken Liver Marinated in Sesame Oil. Has a close texture to the chicken livers in our chicken rice. But their version seems to be more smooth and velvety, almost to Foie gras standard. The oyster is also worth to try. Nama Kaki / Oyster ($6 each) served with Momiji Oroshi & Ponzu. Fresh with a touch of acidity from the ponzu, helps to accentuate the flavour of the oyster. It is a good appetizer. 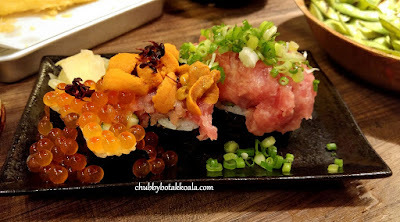 Following the starters, we recommend that you try Nokke Sushi ($34) . 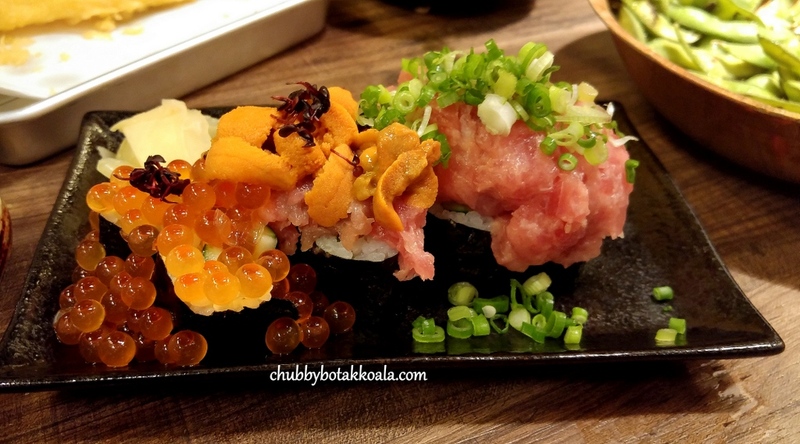 It is a Maki Sushi topped with Ikura Caviar, Uni Sea Urchin and Minced Tuna. Top of the line ingredients that will make you drool. A good grade of Maguro and Uni. I just wish they are more refine in mincing their Maguro. For something heavy in Nimono (simmer) type of dish. Don't miss out on their Pork Belly. Buta Kakuni ($14). I called this dish as my 'rice thief' here. A Slow-simmered Iberico Pork Belly served with Soft Boiled Egg. The pork belly melts in your mouth, nicely simmered in a sweet gravy. The soft boiled egg create the silkiness in the dish and a truly memorable dish. A good dish to have with rice. From the deep fryer, Tori Karaage ($11) is a must try here. 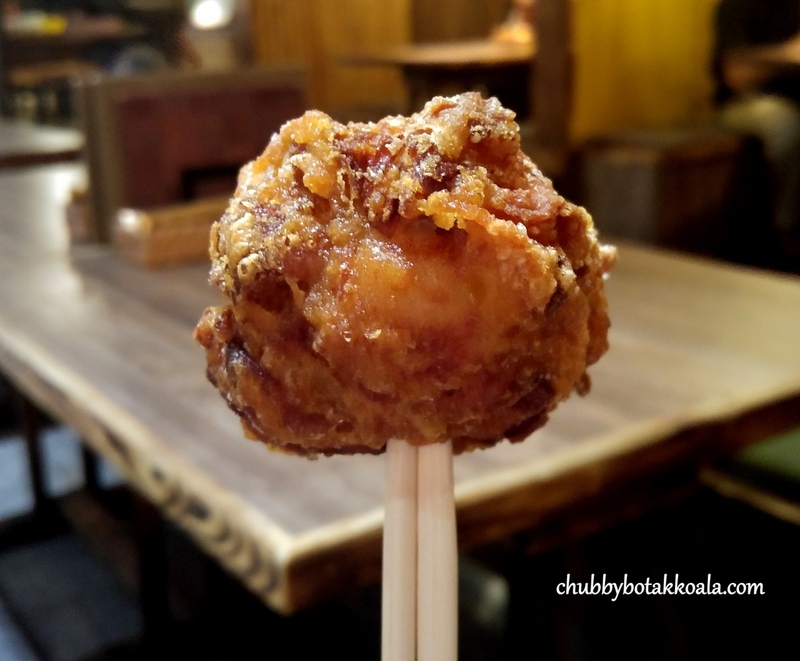 The tori karaage is in the size of a tennis ball. Hmmm, got your attention already. Five pieces in each serving at $11 is just a steal. Well marinated chunks of chicken thigh with soya sauce and fried to perfection. Crispy externally and succulent internally. Sprinkle some lemon juice on top, this will help to reduce any overwhelming factors in it. 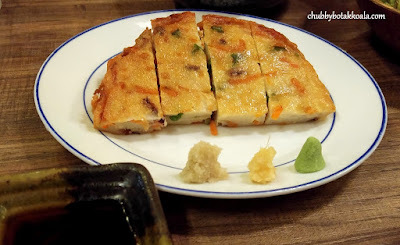 There are other deep fried dish such as Tempura Moriawase ($14) or Satsuma-age ($9), Deep Fried Marinated Fish Cakes. They are all right, but they just won't give you that WOW factor. The commonly found dishes of Izakaya are those dishes cooked with open fire or bbq. Wagyu Beef Rosu ($28) comes highly recommended here. 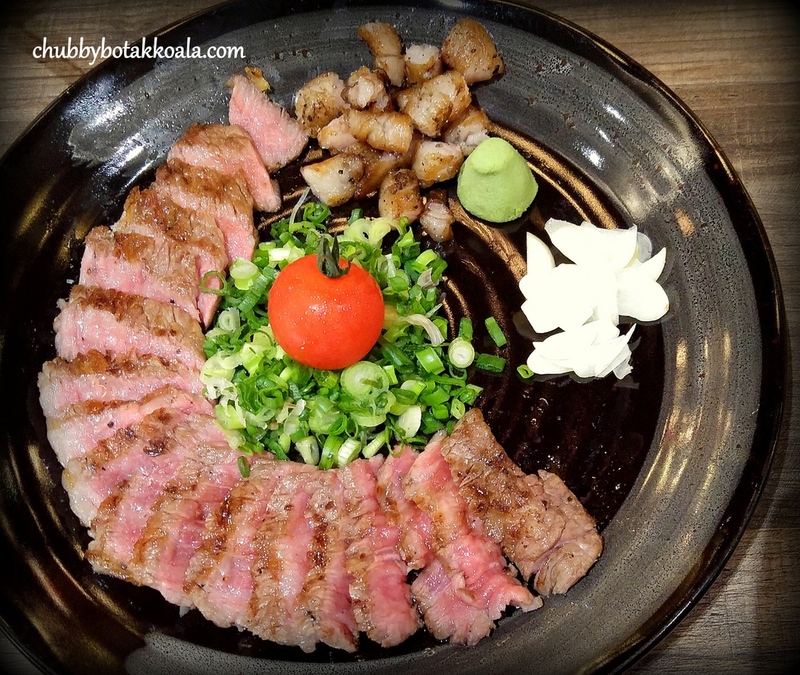 A good cut of Wagyu beef with a nice marbling, perfectly grilled on bed of charcoal with simple seasoning. It is then thinly sliced and served with chopped spring onion, tomato, sliced garlic and wasabi. Each bite you take, you will feel the meat melts in your mouth. Totally a Beefgasm!! For seafood, Maguro No Kama ($25) or Charcoal Grilled Tuna Cheek is good as well. Expect 30 mins wait for this dish, they uses blue fin tuna cheek that contain toro quality meat. Don't expect the same level of fattiness as yellow tail, but the charred and crispy flavour is just so inviting. A certain part of the cheek can be a bit dry, but the solid soya sauce helps to moisten the tuna. Another interesting dish that we ever tried here is Momoniku Yaki ($15). 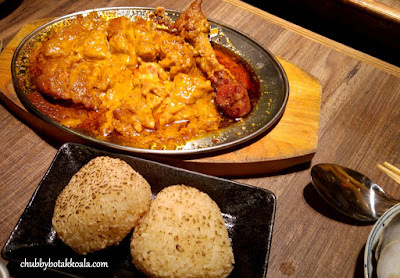 Roasted Grilled Chicken Leg with Original Spicy Sauce Plus Fried Onigiri ($2). It tasted like Chicken curry without the coconut milk. Spicy, aromatic, full of spices swimming on thick and fatty gravy. The Fried onigiri is used to soak up the sauce and as a staple to the dish here. Warning, This dish is very spicy. In case if you want something fast to warm up your tummy. They have Ramen on their menu in a half bowl portion. Their Original Tonkotsu Ramen ($14.90++ for full & $9++ for half) is a solid dish. The tonkotsu broth is robust with bone milky colour. 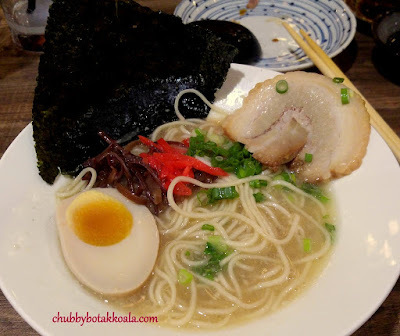 The ramen is springy and the char siew is succulent. All the ingredients for a good ramen. For drinks, they have extensive offering from beer, sake, highball and other mixer. 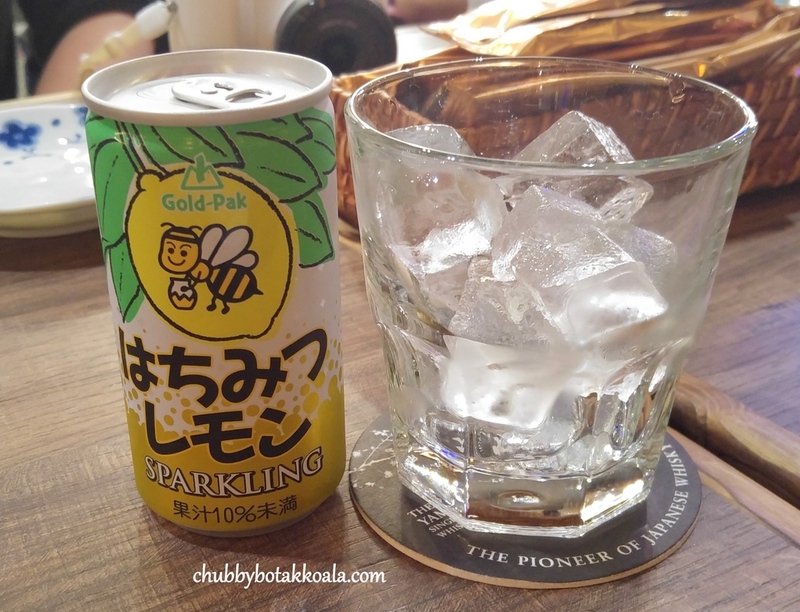 LD enjoyed their Hoppy Beer, while I still have to stick with my Calpis or Sparkling Honey. From the distance the place can easily be recognised as Japanese watering hole. From the long communal tables, small tables plus the bench seating near the sake bar. The service is inconsistent. When it is not crowded, they are very good. However when the place is busy, we just can shake this feeling that they prioritise more on the Japanese customers rather than locals like us. I just hope that they treat everyone equally. This place is full air-conditioned, so no smoking is allowed in the premises. Overall, The Public Izakaya 2 definitely offer different type of dishes compare to the traditional Japanese restaurant. The menu is extensive and deliver in term of quality as well. 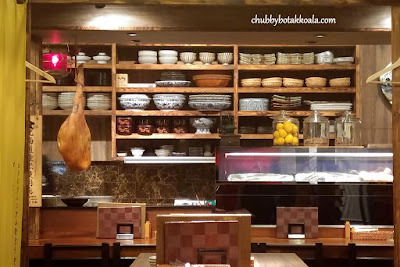 So if you are looking at Izakaya food, check this place out. Kanpai!! Cheers! !